The Colts expected a difficult day at the office, taking on a full strength Anselmians side with just twelve players plus a loaned prop. The score line shows that the Saints made the extra man tell, but the Blues didn’t drop their heads and kept coming back for more. Captain Tom Leicester was picked out as Man of the Match for his two tries and choosing the right options in midfield. Aled Williams opened the scoring for the Blues, popping up at the right moment to touch down after Joe Stubbs had crashed over the line. Mike Green’s defence also caught the eye as he harried the opposition at every opportunity. Ollie Aston slotted the conversions for the Blues. The run up to the Blues first try was started by Mike chasing down the participants in a Saints quick lineout. Unable to make any progress, they had to kick down field to Ollie. Ollie waltzed past an approaching prop, and then chipped ahead into the Saints twenty two, where the defence conceded a lineout. With possession regained at the set piece, the ball was shifted right, Tom putting in Joe in the corner. 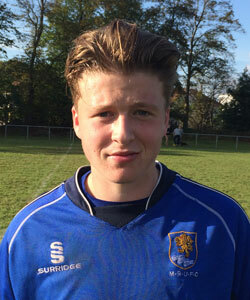 The defence managed to turn Joe on to his back, but Aled nipped in to poach the ball for the first score. A penalty kicked to to the five yard line set up the next try. Tom found himself in a maul under the posts, after the ball had secured at the lineout had moved in- field. Liam latched on to the ball as well. Matt hit the maul at the back, managing to give it the extra momentum required to push the pack over the line. Tom managed to ground the ball with Liam’s help to get the Blues into double figures. Ollie’s conversion was straightforward. Tom’s second try came in similar fashion. Harry launched the ball from the back of a five yard scrum to his fly half. The opposition centres were up quickly in defence, so Tom threw a hint of a dummy , then swivelled past his man to score under the posts. Ollie’s conversion was a formality.